This piece depicts young women, known as saotome 早乙女, doing rice planting. Traditionally, young women would go out into the rice paddies to plant seedlings in the fields during the rainy season, often wearing red waistcloths and straw hats. Although most rice planting is done by machine now, some places in Japan continue to celebrate this traditional method. Here, the hats and bodies of the figures can be removed and turned into tops. Hiroi Michiaki: What is this? Ahh, this is rice planting. This isn’t a top, but, –ah, here, wasn’t there another piece here? This. Um, long ago, this is paddy fields and rice planting, and, ahh, ah, ah, isn’t it right about this time of year? A number of people do this, and these are people who are planting the rice, saotome (young female rice planters). Hiroi: Were they called saotome? In the past, the rainy season was later than it is now, so when it was rainy, they would plant the rice. So in the paddy fields a number of girls would line up and they’d wear these red waistcloths and plant rice. The top is shaped like that. It’s the same [as that]. 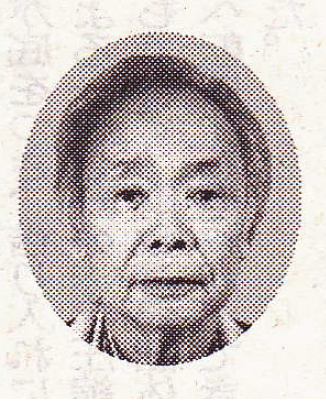 Hiroi-sensei has appeared many times in Japanese newspapers. Below is a translation of an article entitled “Seven Artisans Compete with New “Sendai Fortune” Products” that ran December 27, 2008 in the newspaper Kahoku shinpō. See the original Japanese article at the link below. Nice to meet you. I’m a kokeshi who is proud of my smile. The Akiu Craft Village of Akiu, Taihaku Ward, Sendai City will begin selling a new kokeshi this January called “Sendai Fortune.” It was so-named by the seven artisans of Akiu, who made it in the image of a woman calling upon luck. It is being sold as a new character made with a modern twist on traditional arts. 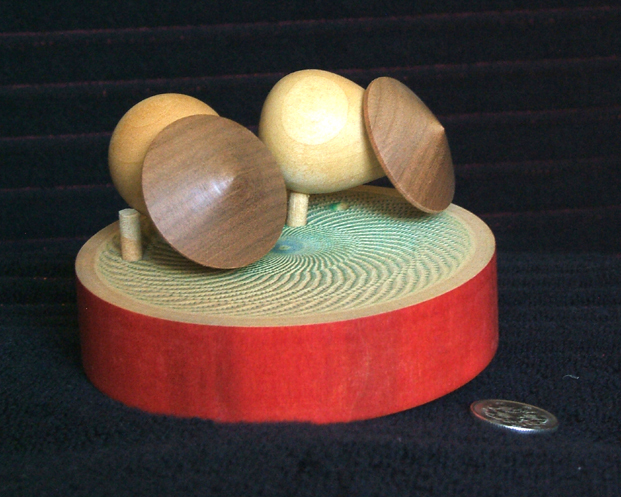 The Sendai Luck ranges in size up to about 10 cm tall. 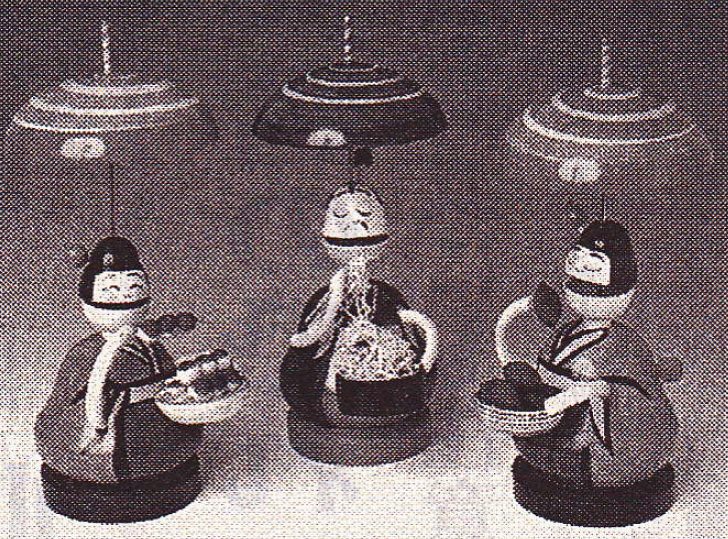 They have kokeshi in the shape of smiling girls and based on the zodiac ox. Hiroi Michiaki (75) and the other artisans of the Craft Village made the doll to invite luck, modeling it on the wife of Fukusuke (god of luck). 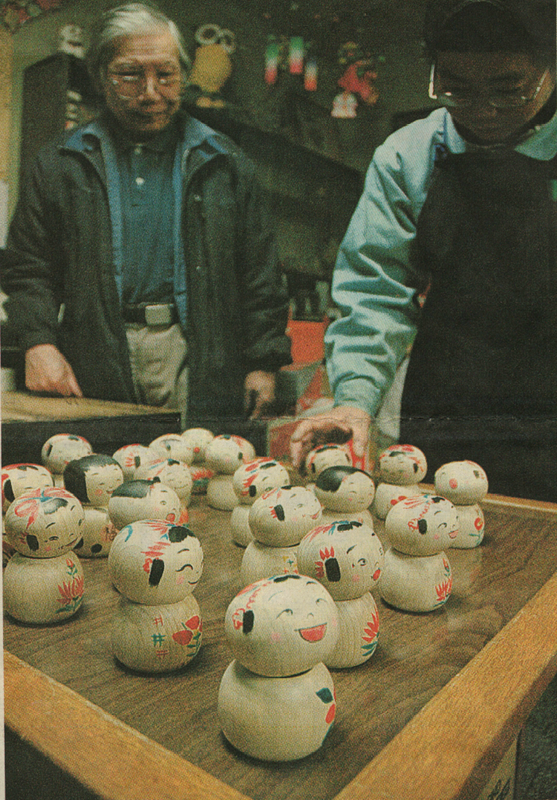 When kokeshi-making began to feel as though it had hit a slump, Hiroi called on his artisan colleagues. By challenging one another, they aim to increase their technical skills and imbue their wooden products with a new appeal. The Sendai Fortune kokeshi cost around 2,000-3,000 yen. 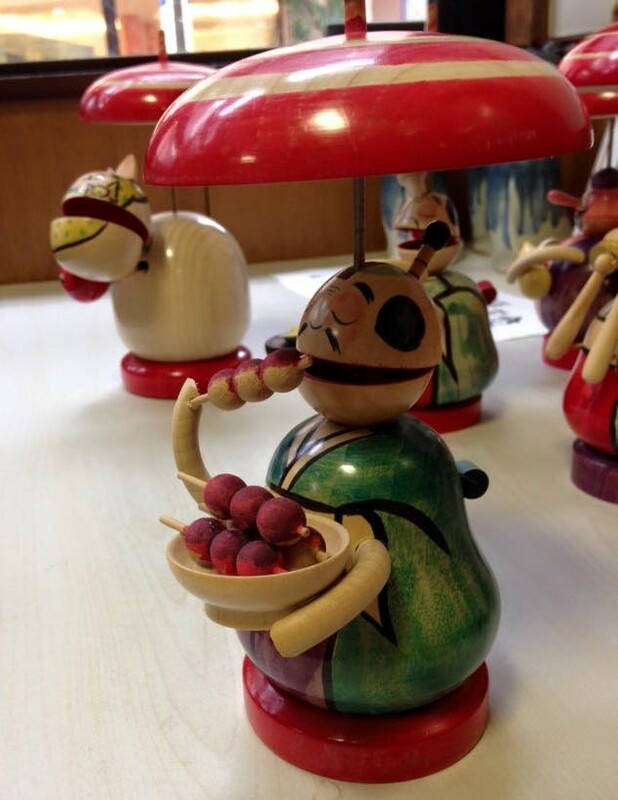 This time they’ve made about 100 kokeshi, and the Craft Village opens up for sales from January 1-4, 10AM-4PM. In addition, there will be bamboo stilts (takeuma), wooden paddle games (hagoita), and traditional kites (surume tenbata) on sale. According to Hiroi, “We want to create products that make people excited, and in the future, too, have the luck of Sendai active in many places through the Craft Village’s original character.” Hiroi’s contact information is 022 (398) 2770. These photos show Janell at Miyagi Gakuin Women’s University, where she taught for many years. The first photo shows Janell with three of her English Department staff in front of their old administration building at Miyagi Gakuin Women’s University. The second is Janell speaking to the junior-high students in the chapel of Miyagi Gakuin’s old campus. The black and white photo is Janell taking part in a ceremony after she donated hand bells to the junior and senior high school from America. Janell sharing in the ceremony of accepting hand bells she brought to the Miyagi Gakuin junior and senior high school from America. Janell with three Miyagi Gakuin English Department staff outside the administration building. The following images are from exhibitions of Edo tops made by Hiroi-sensei.